Preciosa Machine Cut bicone / rondell crystal beads are the perfect accent for all types of jewellery projects. These handy strands come in a fabulous array of mixes. So whatever colour palette you are designing for, you will find the perfect collection of crystal beads without having to break the bank! 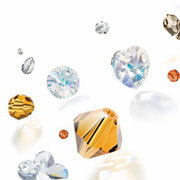 Their durability and perfection of their cut also means the crystal will not wear down or lose its brilliance. Each strand of 6 mm bicone beads contains 21 beads. Please note that the pictures are representative of a typical mix, exact shades / proportions may vary and please also allow for colour differences between computer monitors.